Personal injury law allows people who are hurt in accidents caused by others to recover money for their injuries. Under California law, if an accident was caused by the negligence of someone else, injured victims are entitled to compensation for the losses they sustain as a result of the accident. While no amount of money can erase the past, it certainly can help victims feel that justice has been done and that the person or party responsible for their injuries has been held accountable. Medical expenses often account for the largest portion of an accident victim’s losses, especially in cases in which a person required emergency medical treatment, hospitalization, or surgery. Additionally, when accident victims develop long-term disabilities, the medical expenses they incur because of an accident may last a lifetime. Many accident victims experience significant physical and emotional pain and suffering as a result of an accident. Under the law, victims of an accident are entitled to be compensated for the anxiety, inconvenience, grief and distress an accident causes them. The attorneys at the Law Offices of Gary C. Eisenberg are very skilled in maximizing each and every client’s compensation for pain and suffering. The injuries that accident victims sustain can prevent them from working for weeks, months, or even for the rest of their lives. Fortunately, the law allows accident victims to recover for past, current, and future lost income. Accidents like motor vehicle accidents or those involving a person’s home or real estate can often result in physical injuries and damage to a person’s property. 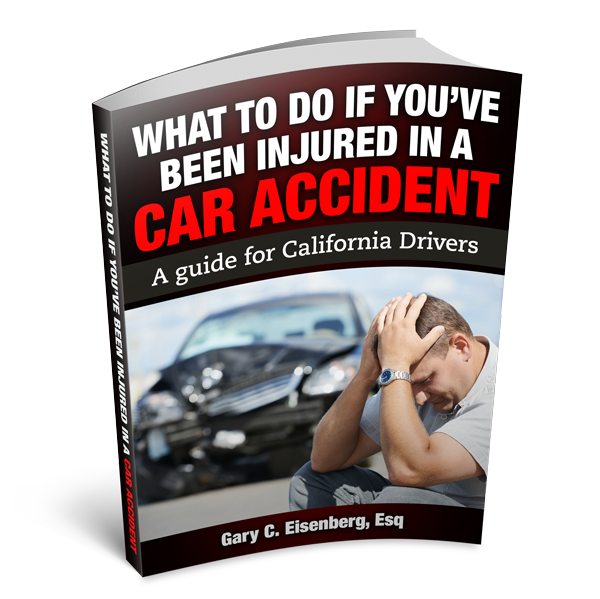 California law allows people who are hurt in accidents to recover for damage to their property. In fact, a person may recover for damage to their property even in cases where they are not injured at all. As a client of the Law Offices of Gary C. Eisenberg, you will be treated like family. Our father-son team of attorneys is committed to working closely with our clients and making sure they receive the compensation they deserve. We never collect a fee unless you recover for your injuries, and we offer free, no-obligation consultations. To schedule an appointment with one of our lawyers, call us today or contact us online.